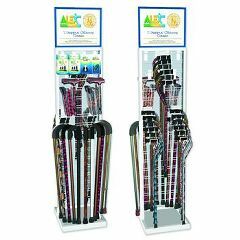 All aluminum, adjustable cane display contains 18 Offset Canes with 12 designer styles, 8 Travel Folding Canes with 6 designer styles and 10 Tourist Handle Canes with 3 designer styles, for a total of 36 aluminum canes. Accessories include tips, wrist straps, and cane holders. All of these items are tastefully displayed in a sturdy, modern, 2-sided display stand. It is shipped with wheels that may be attached to create a mobile display unit with 360 degree accessibility, perfect for stores with a limited amount of space.